The first rails reach Montana Territory, May 9, 1880. The first rails into Montana Territory were laid over Monida Pass with the northward construction of the three-foot, narrow gage, Utah & Northern Railway Company. May 9, 1880, track laying topped the 6,823 ft. elevation pass over the Continental Divide on the Idaho/Montana border. With the objective to reach Butte City (Butte), the first train rolled into the mining city in the late evening of December 21, 1881. At last, Montana had a form of year around, dependable transportation, aiding the start of a major mining boom in Montana Territory. Following completion of a branch to Anaconda, the line reached Garrison on September 23, 1883, the end point of the U&N. Started August 23, 1871 in Ogden, Utah Territory as the Utah Northern Railroad, and using local capital and labor, the U&N was one of the longest narrow gage railroads ever built – for a total main line of 466 miles. Needing additional funding to continue construction, the UN was taken over by the Union Pacific in 1877 under the direction of Sidney Dillon, hence, Dillon, Montana, and reincorporated as the Utah & Northern. With much preparation and manpower staged all along the line, on July 24, 1887, the UP (Oregon Short Line) widened the entire 466 miles of three-foot, narrow gage main line to standard gage (4-ft., 8 1/2 inches) in a single day! Today, the Union Pacific still operates the line from Silver Bow, Montana to Pocatello, Utah, where it joins other UP track leading to points throughout the nation. The last scheduled passenger train on the line, The Butte Special, was dropped with the start up of Amtrak in May, 1971. The narrow gage route to Lethbridge. Coal had been mined near what would become Lethbridge, Alberta, Canada since the early 1870s. By the 1890s growing demand resulted in expanded mining in the region, yet, this was limited until railroad transportation reached the area. In 1883, the Canadian Pacific reached Medicine Hat, Alberta, as part of its transcontinental route. The North Western Coal & Navigation Company, having first tried river boats, set out to construct a 3-ft. gage railway connecting with the Canadian Pacific at Dunmore, just east of Medicine Hat. The 109 mile line was constructed in 1885 to haul coal from Coalbanks. adjacent to the newly laid out town of Lethbridge. Within ten years the little narrow gage was annually hauling 90,000 tons of coal. On December 31, 1889, the Alberta Railway and Coal Company leased the North Western Coal line with a one-year option to purchase it. The AR&C, 1890, constructed a line from Lethbridge to Coutts, Alberta on the International Border, and simultaneously built a U.S. subsidiary, the Great Falls & Canada Railway Co. from Coutts to Great Falls, Montana where it connected with the Great Northern Railway. Great Falls, as of December 1890, was served by two railroads; one narrow gage (GF&C) and the other standard gage (GN). By September, 1902, the Alberta Railway & Coal Company began to standard gage its lines. On January 1, 1903, the Great Falls & Canada and the main line in Canada to Stirling, Alberta, was standard gauged. In 1904, the Great Falls & Canada was bought by the Great Northern Railway. The AR&C, having been renamed Alberta Railway & Irrigation Company, leased its rail operations to the Canadian Pacific in 1912. While much of today’s BNSF line from Great Falls to Sweetgrass, on the International Border, has been relocated and rebuilt, portions of the old Great Falls & Canada right away can still be found meandering through pastures and fields; with one depot still standing on private land. The Great Falls & Canada yards and roundhouse in Great Falls, were located on the west bank of the Missouri, in the vicinity of the former Cascade County Shop complex. A pioneer in heavy railroad electrification. By 1892, Marcus Daly’s Anaconda Copper Mining company was shipping larger and larger amounts of ore and materials between the mines in Butte and the smelter in Anaconda. Beset with rising freight rates from both the Northern Pacific and Union Pacific, as well as their jointly owned Montana Union, Daly determined to build his own railroad. The Butte, Anaconda & Pacific Railway was incorporated as in October, 1892. 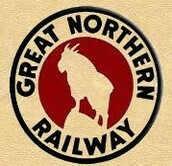 With earlier established alliances, the Great Northern Railway (Montana Central) financed and supervised construction of the BA&P for shares of stock and first mortgage bonds of the new road. ACM, in few short years bought back the majority of these securities, holding a majority ownership by 1895. Some survey work had been done in 1891, and limited construction started in 1892. With completion of grading and bridges, laying rail was completed and limited freight service begun in December, 1893. The first passenger train rolled into Anaconda on December 26, 1893. Through service was now possible between Anaconda and points east, via the BA&P and connecting Great Northern Railway, with the GN operating the new road for the first year. Most important, ore hauling over the BA&P started in January, 1894. From the very beginning, Marcus Daly had envisioned the BA&P building its line through the mountains to the west of Anaconda, reaching the Bitterroot Valley, and heading north to intercept the Northern Pacific main line near Missoula. In fact, track was built to the Southern Cross mining district, 22 miles west of Anaconda, but never beyond. With the rapid development of electric transmission and motor technology, the mining industry converted as rapidly as possible from steam power to electric pumps, compressors and associated mining machinery. By 1910, BA&P management were studying electrifying the line based on the costs of operating heavy ore trains with steam locomotives. The company had been replacing its first locomotives with large power to cope with increasing demands. In late 1911, a contract was made with General Electric to electrify the entire BA&P main line, yards and branches, with the exception of only a few spurs to remain steam powered. Regular electric powered freight and passenger operations began in October, 1913. Initially, GE supplied 17 freight and 2 passenger 1,200 h.p. motors (electric locomotives) operating on 2,400 volt direct current; each capable of running singly or in multiple unit combinations. Once phased in throughout the system, dramatic operating cost savings were almost immediately experienced. Heavier ore trains were being handled, increasing the capacity of the entire railroad. This success had a direct effect on the decision to electrify the Milwaukee Road. In 1952, the BA&P replaced its few remaining steam switching locomotives with 3 diesel electric road-switcher locomotives; followed by 4 more in 1957. In the same year, General Electric built 2 new 2,480 h.p. electric locomotives expressly for BA&P to supplement the aging (built 1913 -1917) electric fleet. By 1967, use of the heavily worn electrical system and aging electric locomotives was discontinued, with diesel-electric locomotives doing what became diminished work as foreign copper mining and low grade ore began to greatly diminish mining in Montana. Passenger service had been gone since April, 1955. In 1976, ACM was acquired by Atlantic Richfield Corporation, but by 1982 had ARCO, faced with new environmental regulations, poor copper prices and increasing foreign competition, closed all Montana operations. In 1985, now operating as a short line, the BA&P was acquired by Rarus Railway; it was bought in 2007 by Patriot Rail Corp. The first transcontinental rail route in Montana Territory. Building west from Minnesota in 1871, Northern Pacific construction was stopped for seven years at Bismark, North Dakota Territory due to the deep financial panic of 1873. Frederick Billings’ (Billings, Montana) reorganization of the line’s finances allowed the NP to resume construction westward in 1880. Concerned with competition from the Union Pacific’s Utah & Northern, the NP wanted to push into Montana Territory as quickly as possible. Several years earlier, NP construction had begun in western Washington. Now, the road opened multiple construction efforts to complete the line. With plans to terminate in Tacoma, Washington, but wanting to quickly reach the Pacific, the NP struck an alliance with Henry Villard’s Oregon Railway and Navigation Company, which ran east out of Portland, Oregon into Washington Territory. Villard, through a proxy battle with Billings took over the NP. Finally succeeding in linking together all of its track construction segments, Villard held a gold spike ceremony September 8, 1883, at Gold Creek, Montana Territory with former President, Ulysses S. Grant present to help celebrate completion of the nation’s second transcontinental railroad. In three short years, Montana had witnessed a dramatic transportation change with major impact on its development. Having used federal land grant financing, the NP amassed vast prairie and timbered tracts, which it used for settlement, agricultural and natural resource development. Even so, like most U.S. railroads, the NP suffered another bankruptcy resulting from the 1893 silver panic. In 1889, with mining booming, the NP built the “Butte short line.” This route branched off the main line, west of Bozeman, ran over Homestake Pass, and thru Butte to rejoin the original Helena main line at Garrison. An 1886 agreement with the UP to jointly own and operate the Silver Bow – Garrison portion of the line as the Montana Union Railway, ended with the 1893 panic, and the NP taking over this former Utah & Northern route. Though primarily used for passenger service, this gave the NP its own trackage into and out of the mining city. Yet, most freight traffic went by way of the original, shorter line over the Mullan Pass via Helena. In 1970 the Northern Pacific Railway was merged into the Burlington Northern, which in 1996 became the Burlington Northern Santa Fe Railway. The original NP main line from Huntley, Montana to Sand Point, Idaho has been operated under lease by Montana Rail Link since 1987. The NP’s North Coast Limited and Main Streeter passenger trains were replaced in 1971 by Amtrak’s North Coast Hiawatha, which itself was discontinued in 1979. Montana’s second transcontinental rail route. James J. Hill was above all, a visionary, while at the same time having strong business and finance acumen. Having both shipping and railroad holdings, he turned his attention to the west, steering his St. Paul, Minnesota and Manitoba Railway (The Manitoba Road), to the Pacific coast. Canadian born, Jim Hill had a sound grasp of the development potential that lay along the southern Canadian and northern borders of the United States. With private financing, the Manitoba Road reached Great Falls, Montana Territory in 1887. Hill’s personal friend, Paris Gibson telling of the abundant water and good land, lauded the area as a place for the new railroad to build shops and industry. Also, having knowledge of the growing mining boom in Butte, Jim Hill visited and befriended Marcus Daly. It was readily apparent that the Manitoba Road needed to reach Butte as soon as possible, as the freight traffic potential was enormous. Shortly before Manitoba Road rails reached Great Falls, a wholly owned subsidiary, the Montana Central Railroad, was begun between Great Falls and Butte. By late 1887, the Montana Central was “ironed” to Helena, and on into Butte in 1888. The Manitoba Road had its much needed freight traffic, and central Montana Territory had dependable, year around transportation. Soon after, the last steamboats at Fort Benton, turned their bows down the Missouri River to St. Louis, and a colorful era of Montana’s pioneer years came to a close. Now, James J. Hill could once again turn his attention to his original objective to reach Puget Sound and the Pacific Ocean. Surveying several routes, and having no desire to parallel the Northern Pacific Railway west from Butte, Hill started construction west from Havre, Montana in 1890. The road had been the Great Northern Railway in 1889. John Stevens was employed to relocate Marias Pass, and with major effort from C.F.B. Haskell, the line was laid out through the Montana and Idaho Rocky Mountains. The Great Northern Railway was completed to Seattle in 1893. Branches were built in Montana to serve mining and agricultural areas, allowing settlement and development throughout the state. A second main line (the Montana Eastern) was started in 1912, running east from Lewistown, Montana to New Rockford, North Dakota, but was never completed due to economic conditions. Always well managed, the GN never missed a dividend, nor suffered a bankruptcy. It merged into the Burlington Northern in 1970, which became the Burlington Northern Santa Fe Railway at year end, 1996. Originally called the Oriental Limited, the Empire Builder, named in honor of James J. Hill, was the premier GN passenger train, lasting, until Amtrak in 1971. Today’s “Empire Builder” is the only Amtrak long distance passenger train still carrying its original name. Montana’s third and last transcontinental line. Chartered in 1847, as the Milwaukee and Waukesha, and changed to Milwaukee and Mississippi Railroad Co. by 1850, the beginnings of what became popularly known as the Milwaukee Road played an important role in the nation’s early mid-western settlement. For competitive reasons on November 28, 1905, the board of directors authorized building a westward extension of the Milwaukee Road to reach Tacoma and Seattle, Washington; thus, “Pacific” was added to the then named, Chicago, Milwaukee and St. Paul Railway Co. This new route was about 2,300 miles, and was built without land grants. Surveying had been started in November, 1905 – prior to formal approval of the project. Interestingly, the route selected proved to be the shortest rail route to Tacoma. However, it bypassed several important cities in Montana and Washington; a fact that would haunt the Milwaukee’s profitability throughout its history. Construction along the entire route, started almost immediately. With mountain ranges crossed and the Yellowstone, Missouri and Columbia rivers bridged, the first through freight service to Tacoma began July 4, 1909. Limited local passenger service started one year later. May 28, 1911 saw the start of the daily Columbian and Olympian services. Strategic branch lines were constructed to reach some bypassed cities, including Spokane, Bozeman and Great Falls. Completed in 1913, the Great Falls branch became a major source of freight revenue. This line was so important that a second main line route was surveyed from Great Falls, through the front range of the Rockies and down the Blackfoot River drainage to Missoula. Due to WWI, and other economic factors, it was never built. Even while under construction, Milwaukee Road management was studying electrification of the line in the Rocky and Cascade mountain regions. The 1909 electrification of Great Northern Railway’s first Cascade Tunnel was noted, and in particular, that of the Butte, Anaconda & Pacific in 1913. Working with General Electric and the Montana Power Company, on November 30, 1915, the Milwaukee Road ran its first main line electric locomotive between Butte and the east side of Pipestone Pass. By early 1917, the entire 460 mile main line from Harlowton, Montana to Avery, Idaho was operating with electric locomotives, powered by clean, “white coal” (snow to water to hydroelectricity), as the Milwaukee advertised. By November, 1919, the route over the Cascades was also running on “white coal,” and later into Seattle. Reports state the huge outlay of $23,000,000 to electrify was recovered in only a few years, thru savings from not running costly steam locomotives over the tough mountain terrain. Never the less, Western Extension business, though profitable, never reached desired levels, and financial difficulties plagued the Milwaukee Road for many years. Following WWII, it saw declining traffic patterns, then, by 1970, increasing competition from railroad mergers and trucking on the Interstate highways. The road dropped the Olympian Hiawatha in 1961, and shut down the badly worn out electrification in June, 1974. Finally, the Western Extension was abandoned in 1980. Montana and the west had lost their last-to-build transcontinental railroad. Mired in bankruptcy, the remaining portion of the Milwaukee Road merged into the Soo Line in early 1985. The Soo Line now operates as a subsidiary of the Canadian Pacific Railway.